Our copper color metal art sun ray solar crackle glass ball color change garden stake light would look great in many outdoor and yard settings. With its beautifully detailed sunflower and glass marble design all around the sun ray shape, imagine how wonderful it would look displayed in your garden, lawn or various planters around your home. 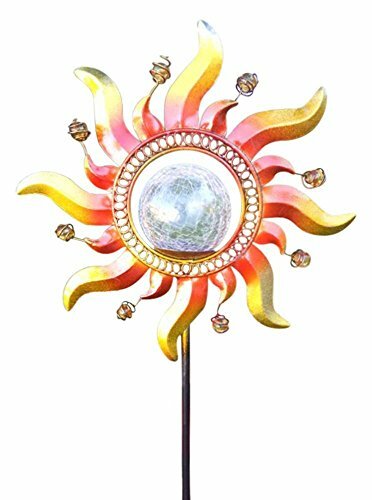 This unique and charming sun ray garden stake would be a perfect decorative accessory for your yard and garden home. Having this excellent solar sun ray multi-color LED will make your next door neighbor jealous. This solar powered glass clear crackle glass ball light transforms any garden and yard into a superb festive party. If you have any questions about this product by Solaration, contact us by completing and submitting the form below. If you are looking for a specif part number, please include it with your message.